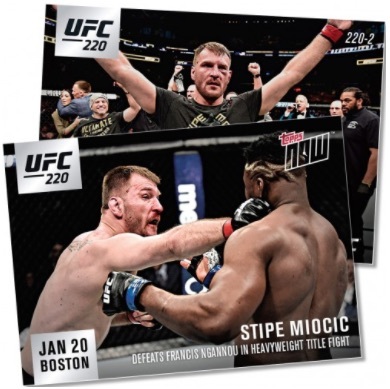 Getting straight to the action in the octagon, 2018 Topps Now UFC utilizes the print-to-order method to celebrate notable UFC events. Primarily for the winners of key bouts, the on-demand exclusive stays with the standard 24-hour sales period. Just as in 2016 and 2017, the 2018 Topps Now UFC checklist differs from other sports because it does not function as a set that builds on itself with sequential card numbering. 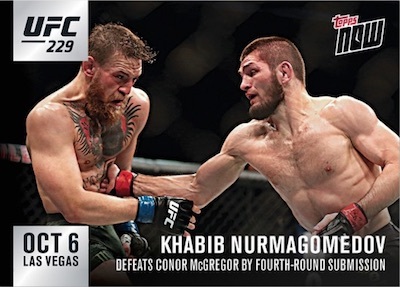 Instead, Topps Now UFC is based around specific events (i.e. UFC 220), and each mini-set takes on that element with card numbering that indicates the UFC event. Buy current Topps Now UFC cards on the Topps site. 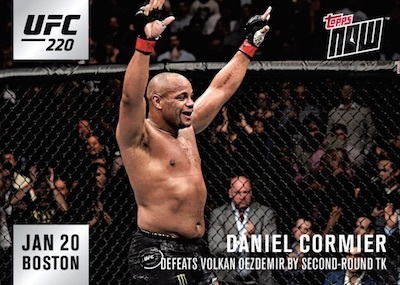 Another difference is that Topps Now UFC has historically been inconsistent, skipping some events entirely and going long periods without a new release. In addition, past sets have included low-numbered autograph versions, which command much larger sums. Nevertheless, the basics for 2018 Topps Now UFC are likely expected for anyone familiar with the format. Priced individually at $9.99, cards are issued online with a 24-hour countdown clock. Only cards purchased during this period are printed and shipped. Final print runs for each card are revealed at a later date. Each purchase includes free SmartPost shipping. Event date for each event is noted. Print runs (PR) will be added when known. 2018 TOPPS UFC KNOCKOUT HOBBY BOX !! FACTORY SEALED-4 AUTOGRAPHS AND 4 RELICS ! 2018 TOPPS UFC KNOCKOUT SEALED HOBBY BOX! 2018 TOPPS UFC KNOCKOUT TRADING CARDS HOBBY SEALED BOX - IN STOCK!